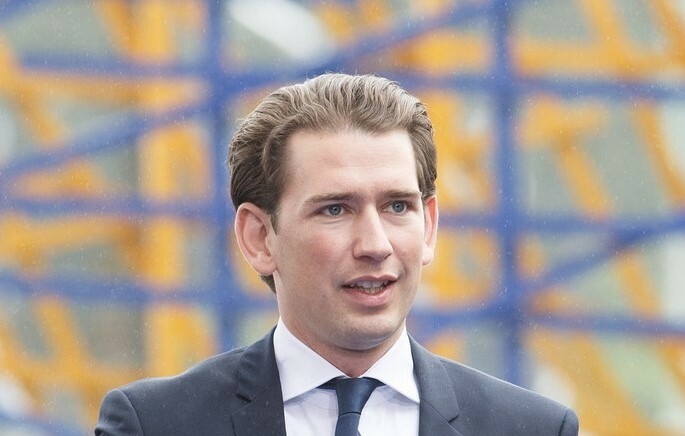 The Austrian Chancellor Sebastian Kurz. Make no mistake: Sebastian Kurz is one of the most dangerous politicians in the EU right now. Behind the youthful veneer and man-of-the-people, public transport travelling Instagram account is an advocate of the same right-wing populist, authoritarian policies that Austria’s eastern neighbours have been preaching for years. What’s more, the Austrian Chancellor and his far-right coalition partners will be holding the EU presidency for the next six months. We already know what’s coming: a right-wing anti-immigrant, Islamophobic agenda, and an attack on social standards and working conditions that will further undermine and even destroy EU solidarity, Schengen and our few existing Social standards. The leader of a nation which has historically straddled eastern and western Europe, Kurz is now very much the new poster boy of hardline, illiberal, racist and authoritarian populism. He may not yet have the notoriety of Viktor Orbán but there is no doubt that Kurz very much belongs in the Visegrád camp. Remember his boast as Austria’s foreign minister of his part in ‘closing’ the Western Balkan route last year? Indeed, the Austrian Chancellor has wasted little time in making his mark on the European stage by demanding the closing of Austrian borders at the recent EU summits on migration. Clearly in favour of reception centres away in third countries with dubious human rights records, this one-time Austrian Minister for Integration had even campaigned on the Australian model of detaining migrants and refugees on remote islands. His recent use of the term ‘axis of the willing’ is yet another clear indication of his dangerous mindset. Kurz’s own Austrian People’s Party (ÖVP), their far-right Austrian Freedom Party (FPÖ) coalition partner, and other eastern European allies have also sowed so much hatred towards migrants and refugees that we simply cannot allow their poisonous rhetoric to continue unchallenged. Furthermore, even if Kurz and his allies were to succeed in expelling all the refugees and migrants, who will they then blame for all the ills of our society? Their voters will quickly realise that migrants and refugees are not the reason! And it can only get worse for the people if the ÖVP-FPÖ coalition continue down this path of malicious labour and social security reforms. Hartz-IV – the German policy that promotes precarious working conditions and low wages – was a major campaign promise by Kurz during the 2017 election. For the poor in Austria, ‘minimum social security’ (‘Mindestsicherung’) is their last line of defence when even unemployment benefit is beyond reach. Yet, Kurz wants to set parameters to exclude those who don’t speak sufficient German or English or have the education qualifications by cutting €300 from their social security allowance to just €563. This is plainly another weapon to target migrants and refugees. Beside the fact that the proposal is in breach of EU laws that give asylum seekers equal access to social services as nationals, how can anyone survive on €563 a month in Austria including rent? These targeted strikes are clearly aimed at minority groups and immigrants – meaning the most vulnerable in Austrian society will struggle to have a stake in our society. Even Europeans are not spared with the introduction of the indexation of child benefits for EU citizens, violating the principle of equal treatment and thus rendering EU nationals from Eastern Europe working in Austria as second-class citizens. On 14th June, the ÖVP-FPÖ coalition quietly submitted a motion in the Austrian parliament – without debates or scrutiny – that will extend maximum working time regulations in Austria. They masqueraded the proposals as ‘flexible working time’ but in reality, a 40-hour working week is being replaced by 60 hours at any time and without conditions – meaning workers might have to work up to 12 hours a day without choice. Overtime payments will fall with no provisions for flextime at all. Free time can no longer be negotiated as well. Such plans constitute the biggest attack to date on workers’ rights and labour conditions in Austria’s modern times. Even the FPÖ had previously opposed these plans! By dismantling the Austrian Act on Organising Working Time, it is an affront to basic EU labour rights and human dignity. Public institutions and government ministries are also under attack like never before. State broadcaster ÖRF, for instance, fended off a recent attempt by the FPÖ to sack its foreign correspondents for their supposed ‘biased coverage’ of the Hungarian elections. Meanwhile, the big four ‘uniform’ ministries in Austria – foreign, interior, state security and defence – are all now under FPÖ’s watch and the far-right ministers have even ordered the special police to raid and destroy ministerial databases containing names of far-right and fascist Austrians. To say this is a violation of democracy is a gross understatement. In the space of just a few months, Sebastian Kurz and the FPÖ’s Vice-Chancellor Heinz-Christian Strache have attacked and undermined all the EU values that we hold so dearly. From a Social Europe to labour rights, our solidarity in dealing with migrants and refugees, to a fairer, more equal society that champions democracy and freedom. In fact, Kurz’s policies are so right-wing that even his ÖVP colleagues here at the European Parliament have distanced themselves from the Chancellor. The EU is at a critical juncture, and the Austrian presidency may well be a watershed moment for the Union. My fear is that this alarming slide into authoritarianism is the start of a very slippery slope. After Austria comes Romania’s presidency – another member state flirting with the Visegrád. Along with Bulgaria, this succession of EU Presidencies could well undo everything that has held Europe together for over 60 years. We, as the Left, can never allow that to happen under our watch. We must start our fightback against this moral decay right now. The future of our EU is at stake. Totally dumb article. But no wonder, the author and this website belong to the far left.